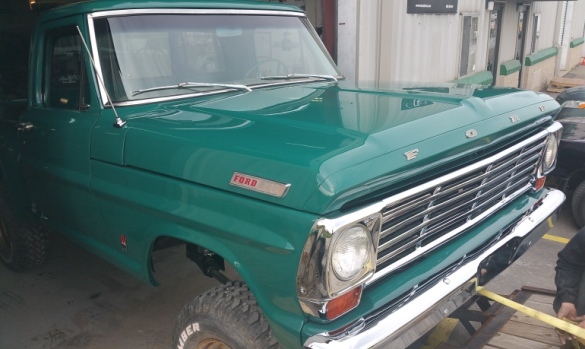 The 1967 Ford F-100 full restoration is now complete! 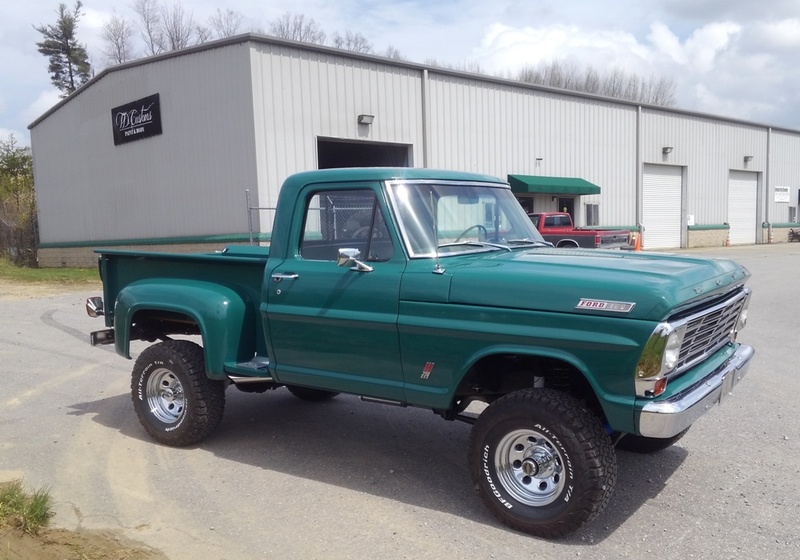 This classic truck restoration has been an extensive restoration project for a few months now. 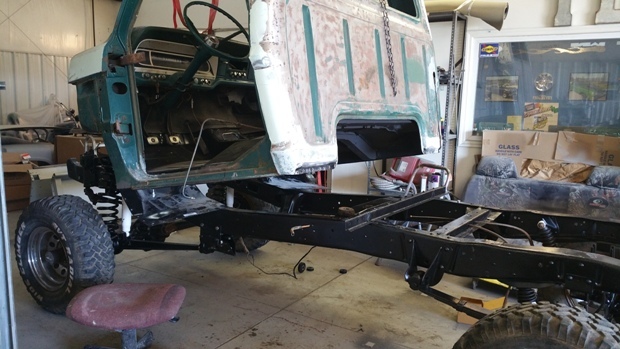 Many restorations don’t involve a complete disassembly where we take the cab and bed off the chassis, like we did here. For this one, we took the entire truck apart to repair every part and panel, and assembled it all back together. The cab required quite a bit of body work on the door panels of the truck to make sure the body lines were straight. There was also a lot of rust repair that had to be done on the floors and sides of the cab. We welded in new metal patches, and put in some noise reducing Dynamat material, so now it’s even better than brand new. The entire frame of the truck got an anti-rust Por-15 application to ensure that no rust will come back. The customer brought us a completely new bed kit from LMC. 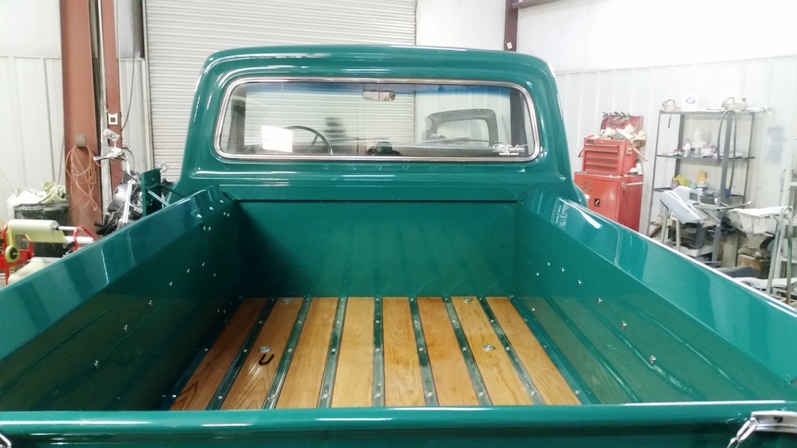 We had to sand the sides of the bed and the tailgate down and paint them, as well as assemble the bed together. The paint color on this truck is Holly Green #2. It is the paint that originally came with from the factory back in 1967. This was a great full restoration job. It was a lot of work, but as always, the end result shows how worth it all that work is. 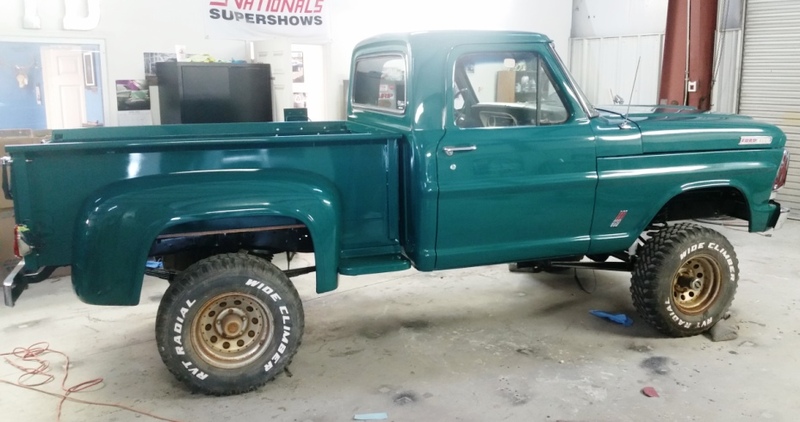 This ’67 Ford F-100 has been given new life, and is going to look amazing riding down the road. The driver’s side is different from the passenger’s side with the extra wheel and tire mounted on the bed. This classic ’67 F-150 is a shortbed, stepside pickup truck with lots of character and nostalgia. 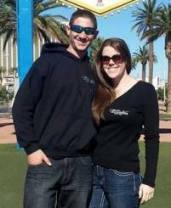 Contact us to discuss your Auto Restoration with us, and take a look at our Photo Gallery to see pictures of our work. 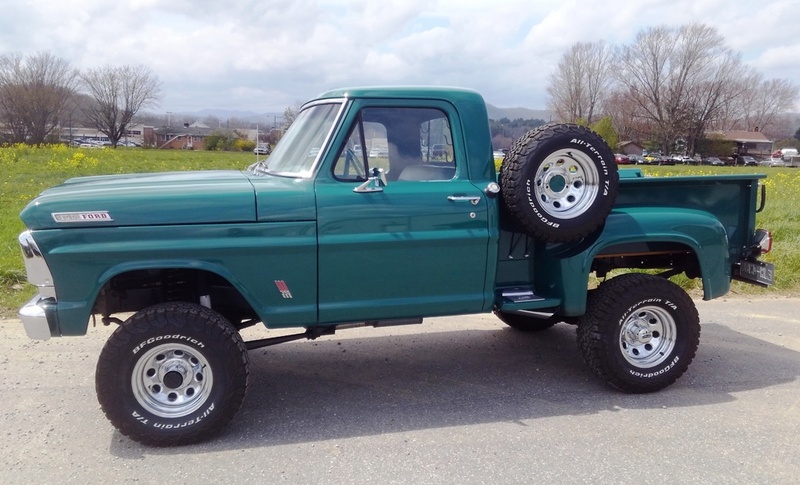 2 Replies to "Completed Restoration: 1967 F-100"
Beautiful! Love the polished grille. How is Holly Green #2 different from plain ol Holly Green? Thanks! It’s a slightly lighter shade. There are actually 3 alternates for that color. Holly Green #2 was the true factory original color from the truck’s VIN. We keep em as original as possible when we can!